And finally I can publish the statistics for July derived from the corresponding timelines (part I and part II). The Daily Trend of Attacks shows a heterogeneous level of activity with a tail of events at the end of the month. 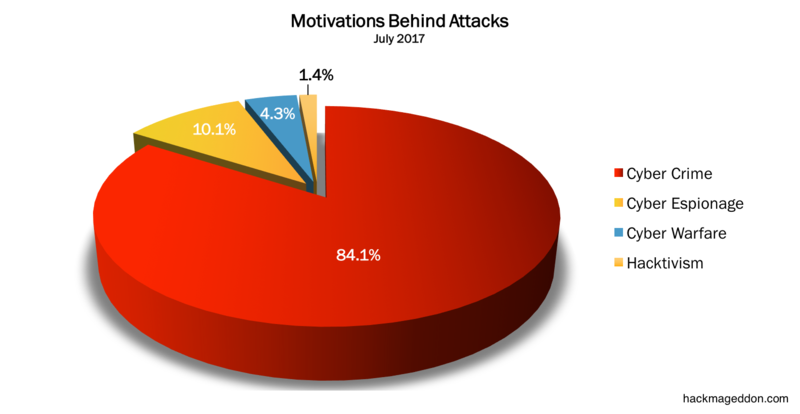 Unsurprisingly Cyber Crime leads the Motivations chart jumping to 84.1% from 68.8% recorded in June. Cyber Espionage slides to 10.1% from 15.6% of June whereas Cyber Warfare plummets to 4.3% from 9.4%. Only a single event driven by Hacktivism in this fortnights, leading to a modest 1.4%. Similarly to June, the Attack Vectors chart is dominated by malware stable at 34.8% (it was 34.4% in June). Account Hijackings rank at number two with 23.2% (it was 7.8% in June). Targeted attacks slide to 13% from 18.8% in June. And finally something new! The Distribution of Targets chart is led by Single Individuals with 27.5% (a percentage as much as twice higher than then value recorded in June, which was 14.1%). Industries slide to 26.1% from 34.4%. Healthcare and government targets complete the podium with 8.7% each. The Industry Drill Down Chart is led by Hotel and Hospitality (22.2%).